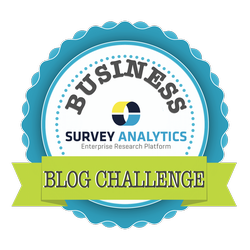 SurveyAnalytics Blog: Day 26: What Are Some Challenges Your Industry is Facing? Day 26: What Are Some Challenges Your Industry is Facing? Keep pushing the rock up the hill. With no challenges, we would never change or improve! A challenge only becomes an obstacle if we bow down to it or don't fight back to do something differently. At the end of the day, Survey Analytics is a SaaS company. Our industry as a business is software. We are a small and quickly growing business. Our customers are in over 30 industries. The challenges we face as an organization in software are very different from the challenges majority of our clients that use our software may experience to perform effective market research. No worries though, we have combined some of the challenges we face in software along with some of the obstacles the market research industry is facing, too. We had the opportunity to ask this same question to qSample President Rudly Raphael about the challenges in the Market Research Industry. Continue reading to see the industry challenges we face together, the first two of the challenges in are in software followed by four in market research. The mobile operating systems have been updating must faster than traditional operating systems. With so many versions out in the field and the quick force to update, it gets hard to control the stability of each version. Something you changed to stabilize on iOS 7 may not work at all in iOS 6 for instance. And many mobile consumers do not upgrade their software as soon as it's available. Other consumers upgrade as soon as it's available and while we are stuck in good old "Apple Jail." Over the past three years, we have been developing mobile apps and learning a lot along the way. iOS has by far been the most tricky with each major upgrade (5 to 6, 6 to 7). Custom default controls in iOS make life much easier than if you try to design your own, too. Luckily for us, we have been able to move past these things that were once an obstacle and see our mobile development team learn some great lessons. One of the hardest things as a development team is to find, agree and stick by the best system architecture for fixing bugs or adding in new features. We work on an agile model of development and push a new build on a bi-weekly basis. This is great because we are approachable and able to develop new features and enhance existing ones without much of a waiting period for our customers. But this is a challenge because things can go wrong when building on that short of a timeframe, too. Hardware problems, communication problems, failure to design with scalability - just to name a few. Another thing that is also prevalent in technology in general is that many developers are very young, worked on their own prior to being on a team and sometimes the decisions get made by the winner of an "ego" battle instead of what really works the best. Plus, many developers have their own separate ways they code and problem solve that are very independent and not so great when working within a group. Earlier this year we brought in a very talented Product Manager (Anup Surendran) to help us get ahead before the pressure becomes a major obstacle for the team. Dealing with a challenge? Fight it as quickly and obnoxiously as Neal Patrick Harris would. While research buyers and suppliers have made this a serious point of discussion over the past decade, data quality and low participation rate among survey respondents continue to plague the industry. If suppliers continue to do whatever’s necessary to seal the deal and research buyers continue to price shop and design extremely difficult survey instruments, certainly the end is not near for either of these issues. Mobile has been positioned and embraced as the next data collection mode of choice, but a lot still needs to be done. Connectivity, screen size or even the respondent's OS can affect the mobile survey taking experience. Perhaps mobile research should be dedicated to specific research audiences or types of research. However, for now, traditional research data collection is still gobbling a huge market share, when it comes to data collection spending. One must agree that a lot of improvements have been made there, but the mobile noise is not proportional with the mobile results. Larger research firms love and rely on brand tracking studies, but they are expensive to administer and some would argue, in the age of consumer engagement whether this form of self reported behavior or reliance on periodic data, as opposed to continuous data is significant. Many of these brand tracking studies are also completed on a "per project" basis. One and done deals. Panel management and ongoing research is an effective way to continually collect information and even run more accurate comparisons over time. Research buyers still have a need for qualitative research in the form of face to face interviews and in person focus groups, but focus group facilities are finding it more and more challenging to recruit respondents and most importantly, managing these operations. While the need is still there, these firms must adapt to the new reality of adopting next generation tools such as eye tracking technology, mobile diaries and so forth. The learning curve is steep and software licensing are not cheap for these solutions.